Situated on the beautiful Broadwater river near Busselton this set of 16 luxury apartments is our newest project. The client wanted apartments that made the most of the views over the river. The exterior of these units will feature a mixture of exposed face brick, rendered finishes and timber highlights. This project has provided a unique experience for working on developments of a larger scale. This represented an exciting opportunity to create stunning apartments using a range of different building products and techniques. Heading into the Christmas break it was important for us to push to get as much done as possible to the ground floor. With site works and clearing complete we could begin work on the ground floor concrete slabs. All 8 slabs have been poured and cured just in time for the break. We currently have bricks being laid on the Southern block ready for the first floor suspended slabs to begin in the new year. 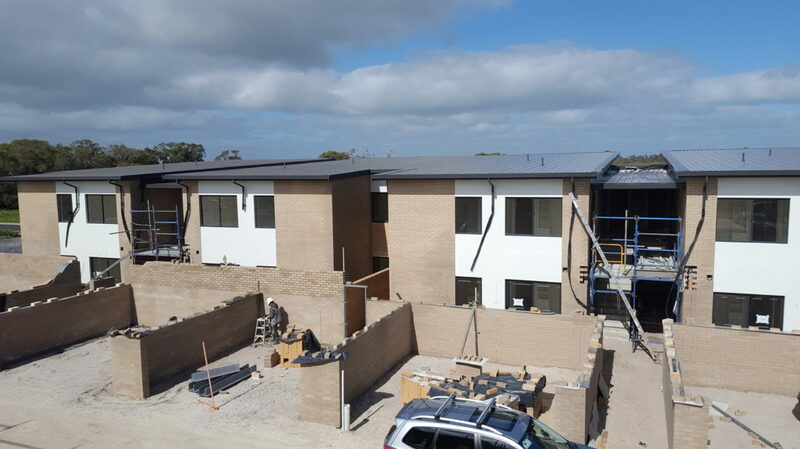 The beginning of 2018 started with a huge push on the brick work of the first block of these Busselton apartments. With 3 teams working on this project we had the brickwork complete in just under 5 weeks. From here the bricklayers moved onto the second block of aprtments while we began scaffolding and formwork on the South Block for the suspended concrete slab pour. On a job of this size its so important that all trades are aware of the schedule and can work in amognst each other to reach our milestones. The formworkers and steelies from FormX did a great job getting the slab ready. The first suspended slab went off smoothly with just under 150 cubes of concrete being poured in 4 hours. Making sure the apartments will be as quiet and contained as possible is vital in close quarter living. Sound can travel huge distances through a concrete slab (just think of a subwoofer on a concrete floor). To prevent this we have been using several products and methods to lessen sound travel through the apartments. Acoustic brick ties, Raupiano pipe and acoustic lagging on pipework are just a couple of different products we have used to achieve this. It is also important to shield the slab from possible noise by limiting what is attached and built into it. Working closely with an acoustic engineer has been a great experience for us to learn about these methods for building close quarter apartments. In the mean time work was well underway on the East Block with bricklayers working hard knowing they had to finish to start the first floor brickwork. With that successfully completed they have started work on the first floor while the suspended slab formwork is being prepared on the East Block of apartments. We have been lucky enough to have some beautiful south west weather which has helped us to push ahead of schedule. Having guys on site that know what they are doing and are passionate about creating a quality custom product has been vital for this build. It can be easy to let things slip when you have to work to tight deadlines but the site supervisor and trades have worked together seamlessly to finish milestones ahead of schedule and to the standard we expect of ourselves. If you want to learn more about the way we build and how we can help you realize your perfect project please contact us today.